With these words the two-day program “The Publishing Sphere” was introduced at Haus der Kulturen der Welt in Berlin. From 13 to 14 June 2017 roundtable discussions, short performances, workshops and literary readings took place, aiming to get a grip on the contemporary publishing sphere and current ecosystems of literature. The conference was convened by Lionel Ruffel (Université Paris 8) with Annette Gilbert (University of Erlangen, Nuremberg) in cooperation with Franziska Morlok (Fachhochschule Potsdam). The speakers of the conference were writers, artists and representatives of initiatives. One topic discussed was the traditional idea of the solitary author and how it has changed in our present day and might develop in the future. Another focus lied on investigations of the different locations of contemporary literatures between an abstract sphere and a material space. The writer and scholar Hannes Bajohr for instance juxtaposed Hannah Arendt’s definition of public/private with what we are experiencing today, in the digital age. “Both the private/public and the material/immaterial distinctions have lost much of their meaning under the conditions of the digital”, he said. Following this train of thought he reflected on our present society and current phenomena related to the nature and use of social media. He presented two interpretations: The first one is that “marking public” becomes central, since postings on Facebook, for example, can be marked public or private. Secondly he posed the question if we should actually now, where public is no longer a place, speak of “doing public” rather than of “going public”. The Publishing Sphere at HKW. In order to explain the meaning of this concept and to describe how literature contributes to the production of our public space, he presented an action-research project focused on the space that is the Trans-Canada Highway. This almost mythic road that crosses Canada from one ocean to another has inspired a wide range of media productions (like images, videos, maps, digital data and literary works), that now mixes with the “real” infrastructure (the road, the motels, the rest stops). Margaret Hillenbrand, who is Associate Professor of Modern Chinese Literature and Culture at the University of Oxford and works in the fields of Chinese film and visual culture, gave a talk on the relationship between photographs on the internet and public memory. One case that she spoke about was the image of the drowned three-year-old Syrian boy Alan Kurdi whose lifeless body washed up on a beach near the Turkish town of Bodrum and was captured in September 2015. This photograph caused a dramatic upturn in international concern over the refugee crisis. With the stated aim to draw attention to the crisis, Chinese artist Ai Weiwei recreated the photo. His pose was similar to that of Kurdi’s lifeless body. Hillenbrand sees the effect of the artist’s action rather critical: There is a high possibility that Ai Weiwei’s recreation of the photograph gets more present and known (in the online world) than the photograph that it is referring to. This would mean that image searches could, bit by bit, replace the actual photo with the artist’s image and therefore, slowly but steadily, erase the original event from the (online) collective memory. Next to these academic talks there were also presentations by publishing brands like Tegel Media which was founded by the novelists Jakob Nolte and Leif Randt, film maker Maik Stefan Schmied, graphic designer Manuel Bürger and web designer Rasso Hilber. Based in Berlin, the platform offers short texts and videos for free reading and watching. The texts (interviews, travel diaries, fiction, among other formats) come in “simple” PDF files and can be downloaded at no charge. Their design (elongated pages, big letters, clear typography) is especially made for reading on smartphones and tablets. Jean Boîte Éditions from France, in contrast, publishes books that are printed, but based on weblogs and image series created with the help of Google Image search, Google Streetview or other digital tools and platforms. This publishing house works with international artists and authors and distributes its books worldwide. 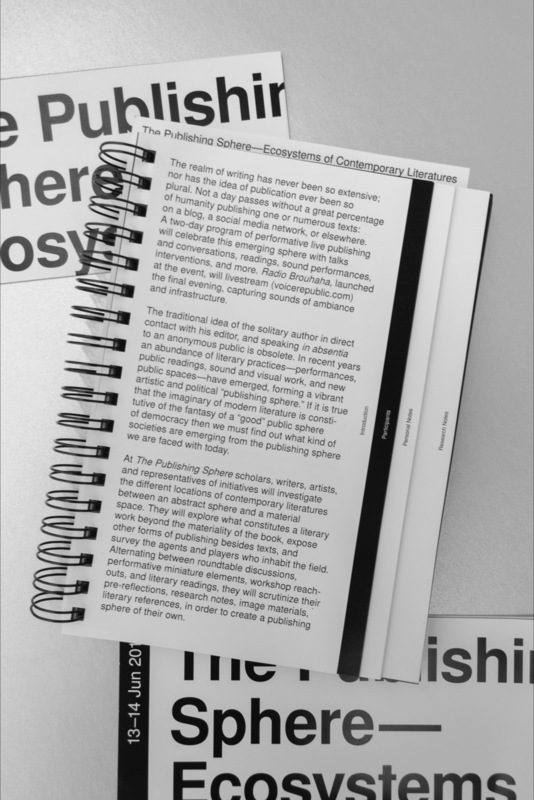 The design of the publications follows aesthetics that remind of classical analogue art books. At some point the question came up whether Margaret Hillenbrand and David Desrimais from Jean Boîte Éditions (JBE) should not actually collaborate. Since publications by JBE bring digital image series into the analogue world, they have the power to document a certain event and/or situation (that will always be in flux in the digital world) and to preserve knowledge. Moments like this one showed that the conference did not only bring together people from various backgrounds, but also managed to create stimulating exchange and enriching conversations. During these two days a publishing sphere of its very own kind could emerge. It would be great to see new ideas and collaborations between the participants developing in the future. The participants, their backgrounds and the material that they handed in prior to the event were captured in a reader. This well designed publication (based on a concept by editorial design students Nadia Pavón Císaro and Magdalena Zagorski) is a valuable contribution to the conference. Unfortunately it was only available for the speakers and visitors of the conference and cannot be purchased by the general public or everyone who is interested in the topic but couldn’t make it to the event. 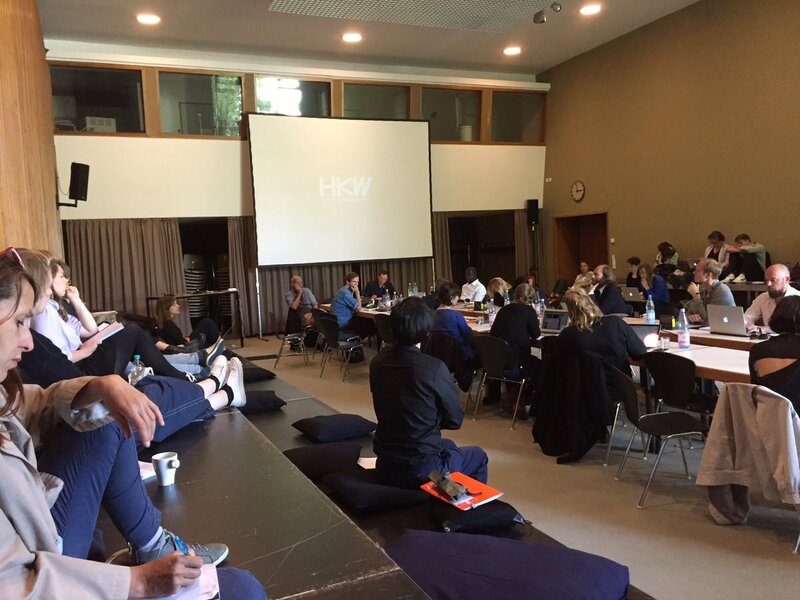 This entry was posted in Conference, report and tagged Anja Neidhardt, Annette Gilbert, Berlin, Franziska Morlok, haus der kulturen der welt, hkw, Lionel Ruffel, Marcello Vitali-Rosati, The Publishing Sphere. Bookmark the permalink.